Pachysandra terminalis and Thymus citriodorus make for great Pacific Northwest ground covers. Some neighbors are better than others. They’ll take in your mail, watch your dog or bring you soup when you’re sick. Then there are those who fight over boundaries or play their music at 2 a.m. So it is in gardens. Designed without thought to neighborly compatibility, plants won’t thrive without an unsustainable amount of effort. 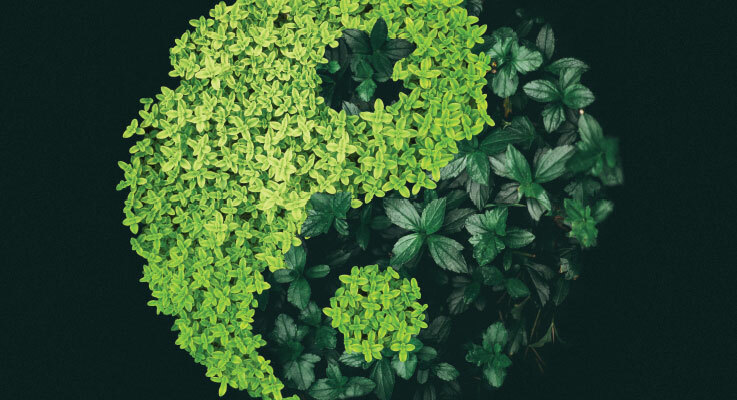 But combined in designed plant communities — a term coined by Claudia West and Thomas Rainer in their book “Planting in a Post-Wild World” — plants can work together as friends. In the book, West wrote about the approach as a hybrid between the wild and the cultivated, what she calls a “new nature” that can flourish in cities and suburbs but needs the help of humans. Designing gardens this way is an interpretation of nature, not an imitation, West said in an interview. Their approach is not about restoring ecosystems — though plant communities call out to pollinators and other wildlife — but rather looking to nature, observing what grows together and designing a creation for the human eye. It’s not a science, but a philosophy — one that’s attracting interest. “Designing with plant communities cannot only link nature to our landscapes, but also bring together ecological planting and traditional horticulture,” West and Rainer stated. Melco’s designs link her love of nature, where she gets her inspiration, and her goal to give clients a low-input garden that appeals to their aesthetic. In her own garden, she’s created a community around an English walnut with species that can take its inclination to suppress a majority of plants because of the allelopathic chemical it releases. Instead of fighting the tree, Melco planted species unaffected by juglone. She put in native plants like wild rose, creeping Oregon grape, sword fern, knick-knick, broadleaf stonecrop and lots of berries, including artic strawberry as a ground cover. Now, the neighboring plants work together rather than fight the site. Though in this instance natives were the appropriate choice, West and Melco steer people to non-natives, as well. 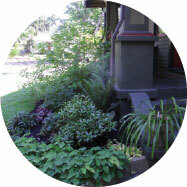 A native-based design is a good place to start, but if a plant fits and isn’t invasive, it’s acceptable — even desirable. 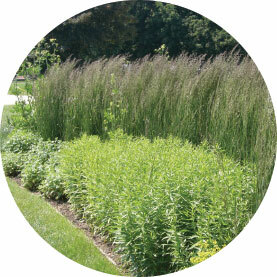 The plantings have the “spirit” of wild spaces that still speak to people but are created to appeal to modern sensibilities that want more ordered landscapes — like bringing more color to the design or planting perennials in a grassland-inspired design closer together to make them more noticeable. Designed plant communities can and should have margins of hedges, walkways, fences, even formal parterres to define them. It’s a practical fusion of designs, West said, appealing to humans and recognizing that urban and suburban gardens are a far cry from the ecosystems of the past. What is set in stone for West is planting in layers, the guiding principle of their designed plant communities. The interlocking layers, she said, are both horizontal and vertical, with vertical playing the most important role. Three layers of herbaceous plants were thoughtfully grouped together. They start with the structural layer: the trees, shrubs and heavily blooming perennials planted in waves of color. The next step is to add plants to fill in the gaps as green mulch — no soil showing, please — like sedges, violets and creeping strawberry. This approach defies the traditional ways of designing in bubbles with a group of black-eyed Susans here and a group of asters there in solitary confinement with mulch as their prison bars. West is quick to explain that the designed plant community is a method, not a style. As long as they’re planted in appropriate combinations in the appropriate way, the plantings can be designed as you like with no inputs of mulch and fertilizer and little or no water. This means using fewer resources, as well as less time and energy. Though not specifically using West’s and Rainer’s particular approach, designers and nurseries in the Pacific Northwest have long encouraged customers and clients to embrace the low-maintenance of arranging like-minded plants in the site situations they require. 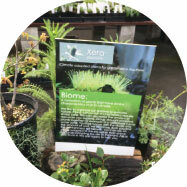 Paul Bonine, co-owner of Xera Plants wholesale and retail nursery in Portland, Oregon, put together signs that describe climate biomes. Around the signs, he’s arranged plants that grow in those conditions. The biomes — xeric for summer-dry climates and mesic for summer-wet — help gardeners group plants appropriately. If they’ve got a south-facing site with reflected heat from a sidewalk, street or driveway, it’s an opportunity for a xeric landscape with cistus, ceanothus, manzanita, lavender, rosemary, callistemon, escallonia and grevillea. For mesic landscapes, he might recommend hydrangea, hosta, willow, stewartia and primula. Their branding is a matter of “edit, exaggerate, endorse.” Xera owners Bonine and Greg Shepherd choose the climate-appropriate plants they want to sell and then put those plants together in groupings in order to exaggerate and endorse them. That said, Hogan says he’s not a “truist.” He’s happy when people learn — through observation or by talking to experienced nursery personnel or designers — to create proper plantings. Like Bonine, he wants to see native chaparral plants like live oaks, ceanothus, manzanita and madrones growing next to Mediterranean cistus, olives and rosemary, even if they aren’t native. “It’s about being informed by the natural environment around us, but in a garden situation there’s no place we touch that we’re recreating nature. In an urban context, we’re creating pleasure and art and we’re lucky,” he said. After designing Kristen Ohlson’s garden and reading her book “The Soil Will Save Us,” designer Amy Whitworth, owner of Plan-It Earth in Portland, Oregon, became fascinated with what goes on underground. Much of it is still not understood, but the relationship between plants and the bacteria and fungi they share through their roots is now accepted knowledge because of work by soil scientists like Elaine Ingham, a leader in research of the soil food web. Whitworth looks to the soil and to nature for guidance when she designs a garden. She looks for plants that fit the site — soil, sun exposure, and moisture — rather than changing the site for the plant. The plantings at the Elisabeth C. Miller Botanical Garden in Seattle, Washington are very naturalistic but they are completely contrived, curator Richie Steffen said. He points to the woodland garden, which is a combination of native and exotic plants, all of which take the same shady, moist conditions. One bed prospers with a tapestry of black mondo grass, Anemone nemorosa, native elk fern and Cyclamen hederifolium mingled in. Like West and Rainer, he interprets the ecological needs of the plant communities, but not necessarily the aesthetics. The reality, Steffen said, is that the design can look like anything. Still, he does have parameters: plants must need the same conditions, repetition (which doesn’t have to be drifts) and plant randomly — something almost impossible for us to do.